CRISTOBAL COLON's Officers on Deck! This view of the Spanish Cruiser CRISTOBAL COLON shows the ship's officers on the gun deck. In the background is one of the vessel's main 25.4 cm (10 inch) gun turrets without its gun. The vessel never received the guns and the turrets would still be empty at the Battle of Santiago. 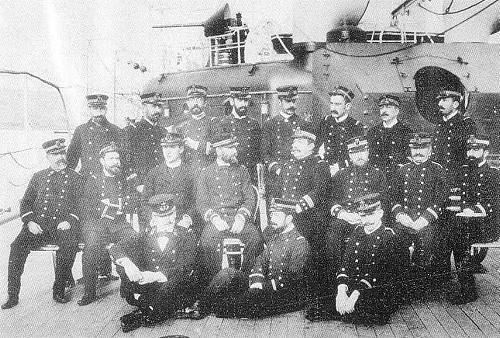 In the center of the group is Capitan de Navio (Captain) Don Emilio Diaz Moreu. Juan Luis Coello Lillo & Augustin Ramon Rodriguez Gonzales, Buques de la Armada Espanola. A Traves de la Fotografia (1849-1900).